Auctiva's FREE Counter. tailored tutorials help teach new concepts. Also if there is any problem when you receive your order. LeapPad Amazing Big To p.
WORDS AND PICTURES SPRING TO LIFE WITH LEAPREADER. EARLY REAADING SERIES ADVANCED PHONICS. LONG AND SHORT VOWELS. 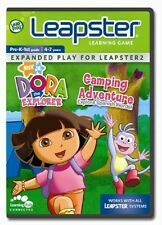 Leapfrog LeapReader DORA THE EXPLORER Dora Goes To School New. Condition is New. === All books are BRAND NEW in retail packaging! However, items may show shelf wear from being handled in a retail store, and packaging may have been resealed. Please see photos for example of condition. The label has wear. I will help you through the start of the sale all the way until the item reaches you. Leapster L-Max Dora The Explorer Wildlife Rescue Cartridge Only Fast Free Ship!! 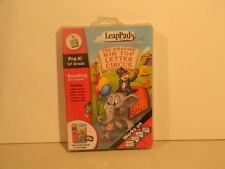 Leapster L-Max Dora The Explorer Wildlife Rescue Cartridge Only Fast Free Ship!!. Condition is Used. Shipped with USPS First Class Package. Dora To The Rescue. Yellow Multi Color. Activities include counting apples, feeding the baby animals, catching stars and crossing the shape bridge. Play and learn in English or Spanish. What it Teaches: Numbers Counting Spanish vocabulary Shapes. A GIFT FROM BIG SISTER DORA. LeapFrog LITTLE TOUCH LeaPad Learning System. from Dora the Explorer from Nick Jr., for the. This has been tested and in very good working order. Learning Book. English and Spanish. This is the Leap Frog Baby Little Leaps learning system disc set of Dora the Explorer for "discovering words and language". It is for ages 24 months and up. This set is NEW-UNOPENED and SEALED in the original clamshell packaging (a little creased on the end). It is smoke-free as well. Thanks for looking! Toddlers explore with Big Sister Dora! Reading storybook for LeapPad Learning Systems. Fiona's parents invite the newlyweds to a ball in their honor, and are shocked to find out their daughter is now an ogre. Pre-owned, Good Condition. Works like a charm! Here is the list of countries: The following international countries are excluded Afghanistan; Albania; Angola; Belarus; Bolivia; Bosnia; Bulgaria; Burma; Cote d'Ivoire (Ivory Coast); Croatia; Cuba; Democratic Republic of the Congo; Greece; Herzegovina; Iran; Iraq; Kosovo; Lebanon; Liberia; Macedonia; Montenegro; Nigeria; North Korea; Paraguay; Republic of the Congo; Serbia; Somalia; Sudan; Syria; Zimbabwe. THIS IS FOR DISC ONLY-THERE IS NO ARTWORK AND NO CASE . DORA THE EXPLORER. PRE-K-K/ AGE 4-6. NEW N SEALED. The item has been described as best I know it, however I do make mistakes. Not compatible with LeapPad or LeapPad Pro learning systems. Team up with Dora and Boots as they reunite a lost little bird with her mother. Category: Leap Frog. For Preschool ages. Item ID: 93164. Works only with the LittleTouch LeapPad system. Dora and Boots are taking baby rattles to Dora’s brother and sister, and they want you to join their adventure. 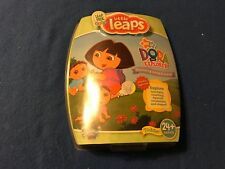 For Sale is a rare and hard to find Leap Frog My First LeaPad Dora The Explorer Dora to the Rescue Book Only ! Its In very good USED condition as can be seen from the pictures provided. Play Tested. Dora the Explorer to the Resuce. LeapFrog My First LeapPad Dora The Explorer To The Rescue Package,Book & Cart. LIFE WITH LEAP READER. DISCOVER LONG AND SHORT VOWELS WITH DORA. EARLY READING SERIES. WORDS AND PICTURES SPRING TO. EXPLORE THE FOREST WITH SOUND IT OUT SUPPORT.